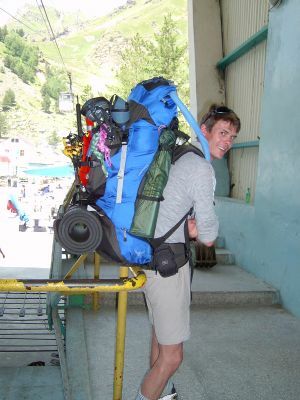 Hans with a full gear load at the base of the lift. Click on this link to see a PDF of our gear list. 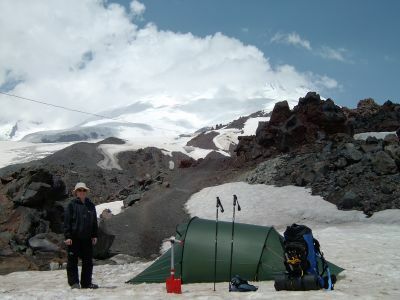 We arrive at 3400m and find a good spot for our tent. 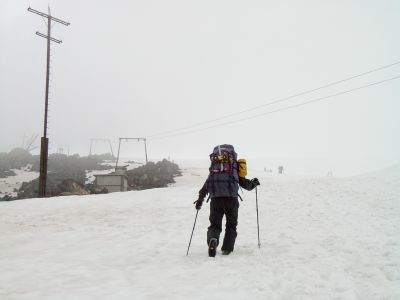 We then take the lift up to 3800m, where we eat our lunch and study the Barrels huts. 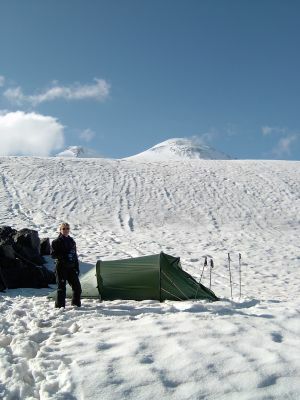 We don't regret choosing to sleep in out tent! Lotte awakes with a bad headache, so we decide to spend another night at 3400m. Later in the day her head gets better and we take another trip with the lift to 3800m. 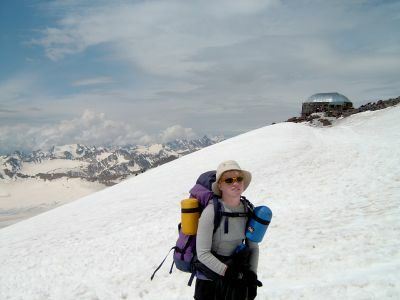 Lotte in front of our camp at around 3400m. In the background one can see the Elbrus peaks amongst the clouds. We feel great when we awake on day 3 so we pack our tent and take the lift to 3800m for the last time. We decide to get away from the Barrels huts and follow rock band until we find a place we can put up tent (see route on page 1). Lotte looking for a tent site around 3900m. At around 3900m we find a good spot after which we do an acclimatization climb to 4400m - just where the prominent rock band ends. When we get back to our tent we both have a headache, but luckily this is relieved by a headache tablet and some dinner. Our camp at 3900m. 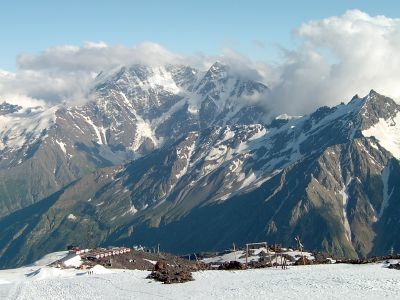 The Elbrus peak is clearly viewed from here. Our camp seen from above. 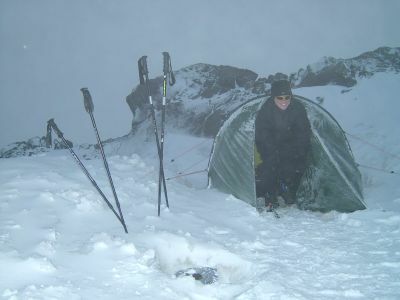 Its a good idea to camp in the sheltered side of the rocks as most of the wind comes from the west and its strong. The views from the south seen from our camp at 3900m. The Barrels huts can be seen at bottom left. 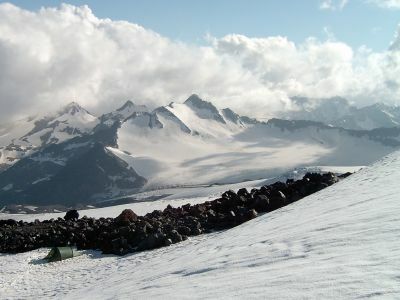 Southern panorama view from the camp at 3900m. Run the mouse over the photo to see the peaks. Ushba's fantastic double peak bathed in the morning sunlight. 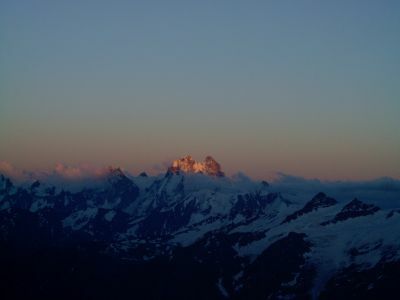 Seen from our second camp at 3900m. Hans on his way to camp 3 at 4400m. Move the mouse over the photo to see points of interest and our route. Lotte in front of the Diesel hut (4157m). The old Priut11 hut burned down a few years back and was replaced by the smaller Diesel hut which houses up to 60 people. Once again we are happy to have chosen our tent! As we climbed higher the wind got stronger, and there was clearly less shelter at 4400m. So we needed to secure our tent properly! 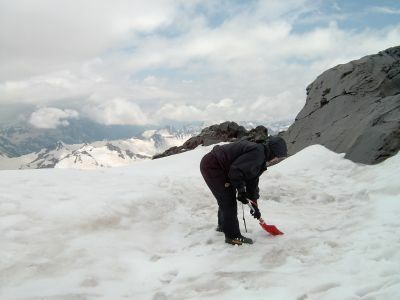 Lotte in the process of digging out a spot for our tent at camp 3. 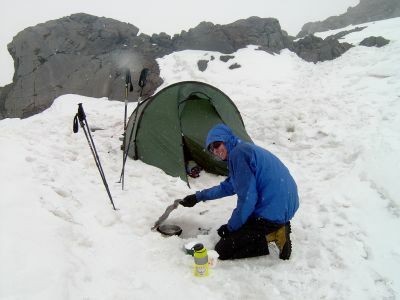 At both previous camps at 3400m and 3900m we had running water, but this luxury was not found at 4400m. Our gas cooker thus had full time work. Hans melting water at camp 3. The weather was not perfect but at least it was stable. Typically it was clear at night and in the morning. 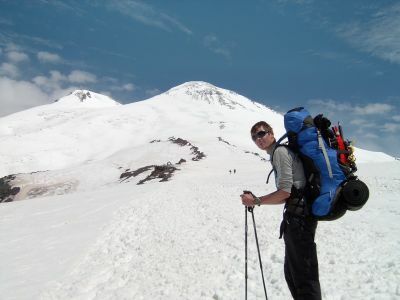 Around lunchtime the clouds moved up from Georgia to the peak of Elbrus and fogs began to form. Day 4 was worse than the previous days as it also began to snow. We thus postponed our acclimatization trip up to 4900m to the next day. Lotte coming out of the fog and snow.